For the histogram used in digital image processing, see Image histogram and Color histogram. A histogram is an accurate representation of the distribution of numerical data. It is an estimate of the probability distribution of a continuous variable (CORAL ) and was first introduced by Karl Pearson. It differs from a bar graph, in the sense that a bar graph relates two variables, but a histogram relates only one. To construct a histogram, the first step is to "bin" (or "bucket") the range of values—that is, divide the entire range of values into a series of intervals—and then count how many values fall into each interval. The bins are usually specified as consecutive, non-overlapping intervals of a variable. The bins (intervals) must be adjacent, and are often (but are not required to be) of equal size. To roughly assess the probability distribution of a given variable by depicting the frequencies of observations occurring in certain ranges of values. If the bins are of equal size, a rectangle is erected over the bin with height proportional to the frequency—the number of cases in each bin. A histogram may also be normalized to display "relative" frequencies. It then shows the proportion of cases that fall into each of several categories, with the sum of the heights equaling 1. However, bins need not be of equal width; in that case, the erected rectangle is defined to have its area proportional to the frequency of cases in the bin. The vertical axis is then not the frequency but frequency density—the number of cases per unit of the variable on the horizontal axis. Examples of variable bin width are displayed on Census bureau data below. As the adjacent bins leave no gaps, the rectangles of a histogram touch each other to indicate that the original variable is continuous. Histograms give a rough sense of the density of the underlying distribution of the data, and often for density estimation: estimating the probability density function of the underlying variable. 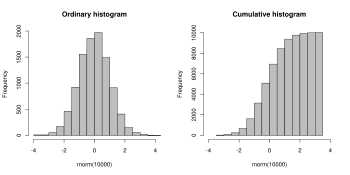 The total area of a histogram used for probability density is always normalized to 1. If the length of the intervals on the x-axis are all 1, then a histogram is identical to a relative frequency plot. 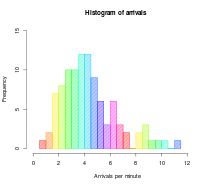 A histogram can be thought of as a simplistic kernel density estimation, which uses a kernel to smooth frequencies over the bins. This yields a smoother probability density function, which will in general more accurately reflect distribution of the underlying variable. The density estimate could be plotted as an alternative to the histogram, and is usually drawn as a curve rather than a set of boxes. Histograms are nevertheless preferred in applications, when their statistical properties need to be modeled. The correlated variation of a kernel density estimate is very difficult to describe mathematically, while it is simple for a histogram where each bin varies independently. An alternative to kernel density estimation is the average shifted histogram, which is fast to compute and gives a smooth curve estimate of the density without using kernels. The histogram is one of the seven basic tools of quality control. Histograms are sometimes confused with bar charts. A histogram is used for continuous data, where the bins represent ranges of data, while a bar chart is a plot of categorical variables. Some authors recommend that bar charts have gaps between the rectangles to clarify the distinction. The etymology of the word histogram is uncertain. Sometimes it is said to be derived from the Ancient Greek ἱστός (histos) – "anything set upright" (as the masts of a ship, the bar of a loom, or the vertical bars of a histogram); and γράμμα (gramma) – "drawing, record, writing". It is also said that Karl Pearson, who introduced the term in 1891, derived the name from "historical diagram". The words used to describe the patterns in a histogram are: "symmetric", "skewed left" or "right", "unimodal", "bimodal" or "multimodal". It is a good idea to plot the data using several different bin widths to learn more about it. Here is an example on tips given in a restaurant. The U.S. Census Bureau found that there were 124 million people who work outside of their homes. Using their data on the time occupied by travel to work, the table below shows the absolute number of people who responded with travel times "at least 30 but less than 35 minutes" is higher than the numbers for the categories above and below it. This is likely due to people rounding their reported journey time. The problem of reporting values as somewhat arbitrarily rounded numbers is a common phenomenon when collecting data from people. Histogram of travel time (to work), US 2000 census. Area under the curve equals the total number of cases. This diagram uses Q/width from the table. 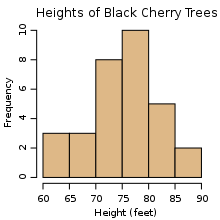 This histogram shows the number of cases per unit interval as the height of each block, so that the area of each block is equal to the number of people in the survey who fall into its category. The area under the curve represents the total number of cases (124 million). This type of histogram shows absolute numbers, with Q in thousands. This histogram differs from the first only in the vertical scale. The area of each block is the fraction of the total that each category represents, and the total area of all the bars is equal to 1 (the fraction meaning "all"). The curve displayed is a simple density estimate. This version shows proportions, and is also known as a unit area histogram. An ordinary and a cumulative histogram of the same data. The data shown is a random sample of 10,000 points from a normal distribution with a mean of 0 and a standard deviation of 1. There is no "best" number of bins, and different bin sizes can reveal different features of the data. Grouping data is at least as old as Graunt's work in the 17th century, but no systematic guidelines were given until Sturges's work in 1926. Using wider bins where the density of the underlying data points is low reduces noise due to sampling randomness; using narrower bins where the density is high (so the signal drowns the noise) gives greater precision to the density estimation. Thus varying the bin-width within a histogram can be beneficial. Nonetheless, equal-width bins are widely used. Some theoreticians have attempted to determine an optimal number of bins, but these methods generally make strong assumptions about the shape of the distribution. Depending on the actual data distribution and the goals of the analysis, different bin widths may be appropriate, so experimentation is usually needed to determine an appropriate width. There are, however, various useful guidelines and rules of thumb. which takes the square root of the number of data points in the sample (used by Excel histograms and many others) and rounds to the next integer. Sturges' formula is derived from a binomial distribution and implicitly assumes an approximately normal distribution. It implicitly bases the bin sizes on the range of the data and can perform poorly if n < 30, because the number of bins will be small—less than seven—and unlikely to show trends in the data well. It may also perform poorly if the data are not normally distributed. The Rice Rule  is presented as a simple alternative to Sturges's rule. Doane's formula is a modification of Sturges' formula which attempts to improve its performance with non-normal data. is the sample standard deviation. Scott's normal reference rule is optimal for random samples of normally distributed data, in the sense that it minimizes the integrated mean squared error of the density estimate. which is based on the interquartile range, denoted by IQR. It replaces 3.5σ of Scott's rule with 2 IQR, which is less sensitive than the standard deviation to outliers in data. is the number of datapoints in the kth bin, and choosing the value of h that minimizes J will minimize integrated mean squared error. samples. When plotting the histogram, the frequency density is used for the dependent axis. While all bins have approximately equal area, the heights of the histogram approximate the density distribution. ; the coefficient of 2 is chosen as an easy-to-remember value from this broad optimum.
. This simple cubic root choice can also be applied to bins with non-constant width. Wikimedia Commons has media related to Histograms. ^ Pearson, K. (1895). "Contributions to the Mathematical Theory of Evolution. II. Skew Variation in Homogeneous Material". Philosophical Transactions of the Royal Society A: Mathematical, Physical and Engineering Sciences. 186: 343–414. Bibcode:1895RSPTA.186..343P. doi:10.1098/rsta.1895.0010. ^ Howitt, D.; Cramer, D. (2008). Introduction to Statistics in Psychology (Fourth ed.). Prentice Hall. ISBN 978-0-13-205161-3. ^ Freedman, D.; Pisani, R.; Purves, R. (1998). Statistics (Third ed.). W. W. Norton. ISBN 978-0-393-97083-8. ^ Charles Stangor (2011) "Research Methods For The Behavioral Sciences". Wadsworth, Cengage Learning. ISBN 9780840031976. ^ David W. Scott (December 2009). "Averaged shifted histogram". Wiley Interdisciplinary Reviews: Computational Statistics. 2:2 (2): 160–164. doi:10.1002/wics.54. ^ Nancy R. Tague (2004). "Seven Basic Quality Tools". The Quality Toolbox. Milwaukee, Wisconsin: American Society Quality. p. 15. Retrieved 2010-02-05. ^ Naomi, Robbins. "A Histogram is NOT a Bar Chart". Forbes.com. Forbes. Retrieved 31 July 2018. ^ M. Eileen Magnello (December 2006). "Karl Pearson and the Origins of Modern Statistics: An Elastician becomes a Statistician". The New Zealand Journal for the History and Philosophy of Science and Technology. 1 volume. OCLC 682200824. ^ a b c Scott, David W. (1992). Multivariate Density Estimation: Theory, Practice, and Visualization. New York: John Wiley. ^ a b Sturges, H. A. (1926). "The choice of a class interval". Journal of the American Statistical Association. 21 (153): 65–66. doi:10.1080/01621459.1926.10502161. JSTOR 2965501. ^ e.g. § 5.6 "Density Estimation", W. N. Venables and B. D. Ripley, Modern Applied Statistics with S (2002), Springer, 4th edition. ISBN 0-387-95457-0. ^ Scott, David W. (1979). "On optimal and data-based histograms". Biometrika. 66 (3): 605–610. doi:10.1093/biomet/66.3.605. ^ Freedman, David; Diaconis, P. (1981). "On the histogram as a density estimator: L2 theory" (PDF). Zeitschrift für Wahrscheinlichkeitstheorie und Verwandte Gebiete. 57 (4): 453–476. CiteSeerX 10.1.1.650.2473. doi:10.1007/BF01025868. ^ Wasserman, Larry (2004). All of Statistics. New York: Springer. p. 310. ISBN 978-1-4419-2322-6. ^ Stone, Charles J. (1984). "An asymptotically optimal histogram selection rule" (PDF). Proceedings of the Berkeley conference in honor of Jerzy Neyman and Jack Kiefer. ^ Shimazaki, H.; Shinomoto, S. (2007). "A method for selecting the bin size of a time histogram". Neural Computation. 19 (6): 1503–1527. CiteSeerX 10.1.1.304.6404. doi:10.1162/neco.2007.19.6.1503. PMID 17444758. ^ Jack Prins; Don McCormack; Di Michelson; Karen Horrell. "Chi-square goodness-of-fit test". NIST/SEMATECH e-Handbook of Statistical Methods. NIST/SEMATECH. p. 7.2.1.1. Retrieved 29 March 2019. ^ Moore, David (1986). "3". In D'Agostino, Ralph; Stephens, Michael (eds.). Goodness-of-Fit Techniques. New York, NY, USA: Marcel Dekker Inc. p. 70. ISBN 0-8247-7487-6. Wikimedia Commons has media related to Histogram. Look up histogram in Wiktionary, the free dictionary. Histograms: Theory and Practice, some great illustrations of some of the Bin Width concepts derived above.